Why are the instruction manuals for cell phones incomprehensible? Why is a truck driver's job as hard as a CEO's? How can 10-percent of every medical dollar cure 90-percent of the world's disease? Complexity is a slippery idea. Things that seem complicated can be astoundingly simple; things that seem simple can be dizzyingly complex. These and other paradoxes are driving a whole new science - simplexity - that is redefining how we look at the world and using that new view to improve our lives. Through the lens of this surprising new science, the world becomes a delicate place filled with predictable patterns, but they're patterns we often fail to see as we're time and again fooled by our instincts, by our fear, by the size of things, even by their beauty. 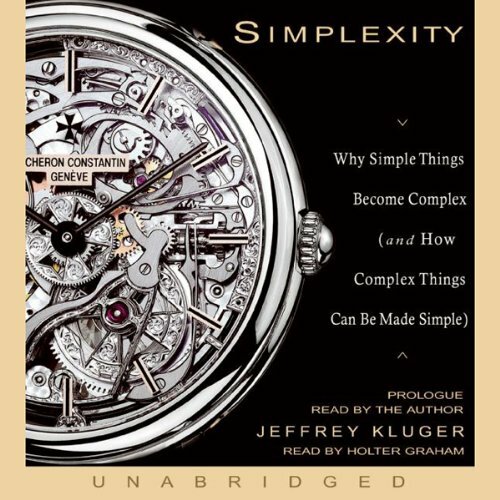 In Simplexity, Jeffrey Kluger shows how a drinking straw can save thousands of lives; how investors behave like atoms; and how physics drives jazz. As simplexity moves from the research lab into popular consciousness, it will challenge our models for modern living. Kluger adeptly translates newly evolving theory into a delightful theory of everything that will have you rethinking the rules of business, family, art - your world. This book is a somewhat like a magazne, with interesting articles peppered here and there, but there is no overarching theme which holds the text together. I wish the author had drawn some conclusions about the otherwise interesting observations he makes about such phenomena as traffic patterns, overly complex technology, and human nature. There was nothing memorable about this book. The idea is great, but there is nothing new here. I didn't even find it very interesting. Too simplicity? Maybe. Where's the beef? I don't think this book will add to your life. Skip it. Go for Reality Check. Much more interesting and entertaining. Starts promising, but the author clear loses sight of his subject as he struggles - unsuccessfully - to encapsulate simplexity as anything more than a vague notion. A failed effort. Ironically enough, this book, while interesting, is a bit symplistic.